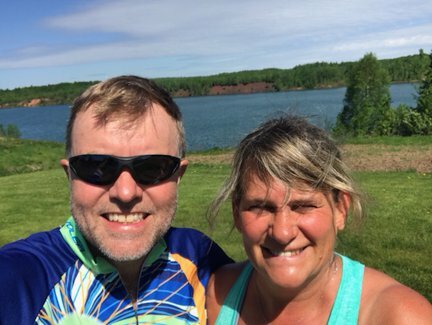 After breakfast, we readied ourselves and rode directly out of the campground a couple of miles back to the Mesabi Trail near Mountain Iron for the return trip to Grand Rapids. I am sometimes asked if it is less favorable, perhaps boring, to ride the same trail two days in a row. The answer to that is a definite no, especially when riding the opposite direction. Although there is a certain amount of familiarity, the perspective and sights and sounds are completely different. This seems particularly true on the Mesabi, which highlights the surrounding beauty of the iron range in such a great way! 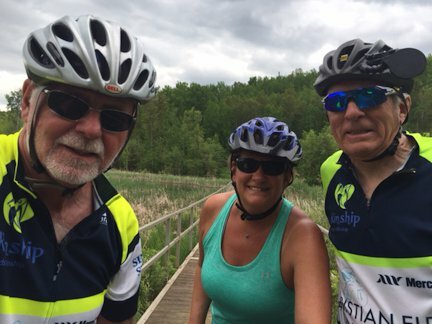 We all pedaled at an easy pace on the first 20 plus miles to Hibbing, where we stopped for a leisurely break. The wind was blowing, but mostly at a crosswind to us, so it didn’t really hinder us too much; also much of the trail is sheltered from the wind. 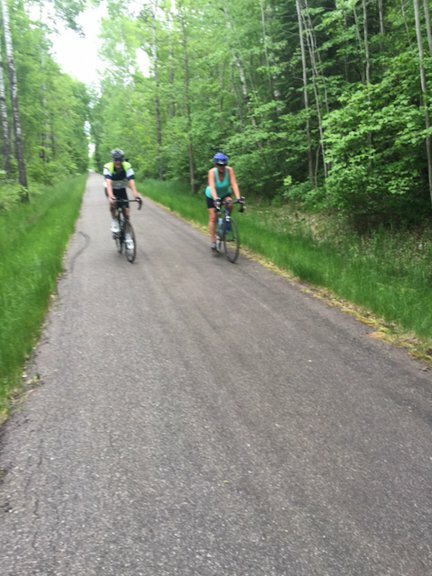 Our pace quickened a little as we rode the second stretch to Pengilly. We encountered some intermittent light rain along the way, but it was actually quite refreshing after the hot 86 degrees of yesterday. 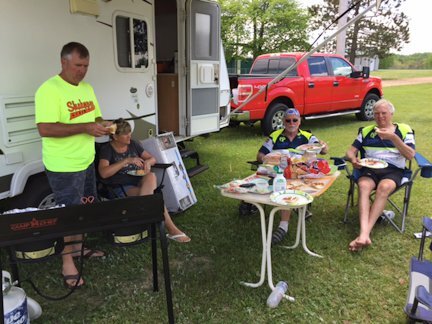 Doug and Anni made some fabulous steak and chicken quesadillas for our lunch stop at the Pengilly baseball field before sending us down the trail toward the finish. As Kathy neared the floating bridge about midway through the last section, a big brown bear stopped on the path less than ten yards in front of her. Kathy had no time to panic or to think or to do much of anything else, but fortunately the bear saw her and ran off the trail into the woods. She doesn’t remember if she was able to stop, but she does know that her heart was racing as she sped to catch up to John and Jack, who just happened to be waiting for her so they could take a couple of selfies. Kathy refused to ride alone for the rest of the day. Now that’s a frightening encounter with nature, much scarier than a couple of grown men seeing a porcupine! Along this ride John also received very bad news. His dog Ranger was not doing well at all and had been staying at the vet hospital for the past couple of days. Ranger’s physical deterioration was so significant that John had no choice but to put him down. We could all tell that John felt horrible not being there with Ranger at this time, and we did our best to console him. After finishing our ride, we drove to Cloquet, setting up camp in the city campground near the river. Before dinner we had a toast for Ranger and swapped dog stories around the picnic table. Soon our dinner was ready. The air was quite chilly outside, so we moved inside the camper for Anni’s lasagna dinner. The aroma of the camper was like that of a little Italian restaurant as we literally devoured a big tray of lasagna with Caesar salad and bread. What a great treat for us! And more carbs to aid us on tomorrow’s ride. It had been a long, tiring day, and it was getting late as we called it a night!